White. White feels open and bright. And having everything the same color gives you a sense of continuity and makes the space feel much bigger than it actually is. Lots of light. One of the most important things to me in the remodel was to put in as much light as we possibly could. I have 8 recessed can lights in the kitchen (including 1 over the sink on its own switch), and 6 in the dining room. We how have most of these switched to LED bulbs, so I feel ok with having all these lights on much of the time. I need bright light for cooking, and I think it also really helps brighten and open up a space. It's one of the biggest comments I get about my kitchen, how wonderfully bright it is. (and also on the electrical topic - if you're re-wiring, take the opportunity to put in LOTS of power outlets). Get rid of the clutter. I know it seems hard in a smaller space, but covering your counter tops with stuff is just going to make your kitchen seem even smaller. We put a lot of thought into the space we had and got really creative with adding space wherever we possibly could. The kitchen looks and feels so much better when everything is in its place - which is off the counter. Look for things that do double-duty, or give the illusion of more space. Our stove is a standard width, but I chose one that had grates that went all the way across the whole top, because I thought it gave the feel of a bigger space. And our microwave also doubles as a convection oven, so I have the use of two ovens when I need them. 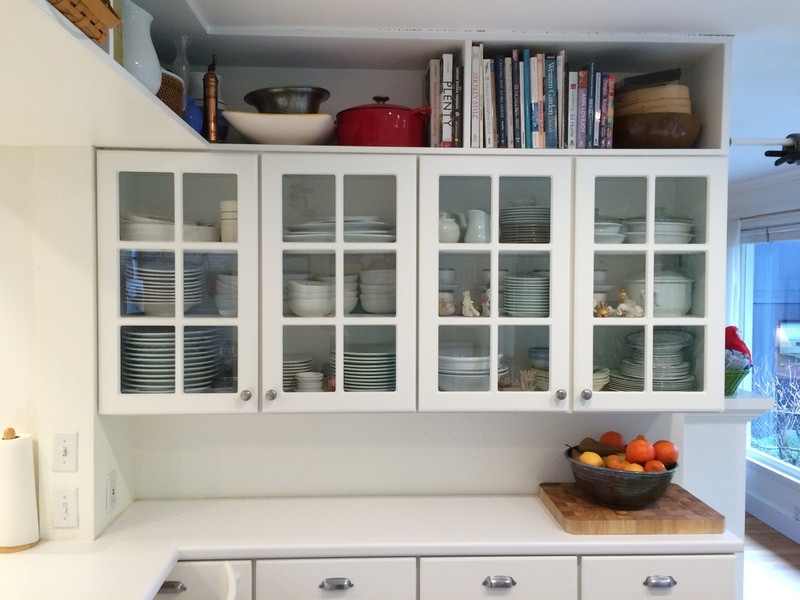 Get creative about creating space - look up, look down, where can you add storage? More on how we did that later. Really think about how you are going to use your space. Prioritize your storage needs. Things you use the most often should be kept closest to where you will use them, and then move outward from there, with the items you use the least often being the furthest away from the main work space. Don't take up valuable space right next to your stove with serving dishes that you use once a year. Nothing you see here is expensive. This is all stock stuff from Home Depot. The cabinets were stock, the counters are just solid white laminate, the floor is vinyl. It was what we could afford, and I think it still totally works. I especially think that if you are going with less expensive materials, then you should not try to fake a fancy look. Solid laminate looks much better than something that's trying to look like fake marble, and I think that embracing the vinyl floor and going with a simple patter looks so much better than faux wood. On the counter in the kitchen the only things that live permanently are the coffee pot, the SodaStream, and the paper towel holder. We could find a place to hang the paper towels, but we use them so much and this is a place where the kids can reach them, and the roll often gets moved around for meals, art projects, mess clean ups, etc. It drives me nuts to have the compost bucket out here, and I do have room for it under the sink, but I've found that it only reliably gets used if it's sitting right next to where I'm working. Our city has recently started threatening to fine you if you put compostables in the trash, so I'm really trying to be better about using it, so I've started leaving it out most of the time. We don't have room under our sink for a trash can (we have recycling there, trash bags, dish soap, and space for the compost - so I found the narrowest trash can I could possibly find. The barstools are from Ikea. We made some decisions in our planning that left our dining room a little smaller, but made the overall space so much more functional. There used to be a slightly higher half wall behind the sink. We took that down to extend an eating bar out and have the whole thing all one height, it makes the counter space feel so much bigger, and I have space for my kids to sit and have a snack or help with cooking (we have a fourth stool that I keep in the garage and bring out if I've got all four kids at the counter). And we added the cabinets and counter in the dining room. That was just the back of a brick fireplace. It technically made the room smaller by about a foot, but it gave us so much more storage. And because we went from dark brown brick to bright white, I don't think it actually looks smaller at all. I love that it's so open from the dining room to the kitchen. The bookshelves just overhead are one of my favorite features. Another thing we did which I absolutely love, is added the bookshelves up at the ceiling. They fit perfectly in the space above our stock cabinets in the dining room. Over the counter there was a structural beam that was coming down that far anyway, so all we did was have the contractor build the shelves down either side of the beam. This is where I store all my cookbooks, vases, some big bowls and baskets, and a few small appliances. It's amazing how something so simple can add so much storage space! You can also see from these pics that we went with all white appliances and white sink. I know stainless appliances are all the rage now, but I didn't like how it would chop up the kitchen. Sticking with my all white theme I think helps my space feel open and bright. So that gives you some idea of the thinking that went into the design of our kitchen. You don't have to spend a fortune to get a nice looking space and make it functional. My kitchen works really well for me. Everything I need for daily cooking is well within reach, and we were able to set up the classic work triangle between the fridge, stove and sink. It's mostly a one person kitchen, it gets pretty cozy if more than one person is working in it. But the counter space in the dining room allows me to have helpers but keep them out of my work space. Now for a little tour of how I use some of the space. All of our dishes for eating and serving are store in the dining room. This makes it easy to set the table. And the dishwasher is just over the counter to the left, so it's pretty easy to put them away too. I would love to have more serving pieces, but this is all the space I have. In the drawers I have paper napkins, trivets and coasters, wine openers and accessories, chopsticks, and some extra silver pieces. 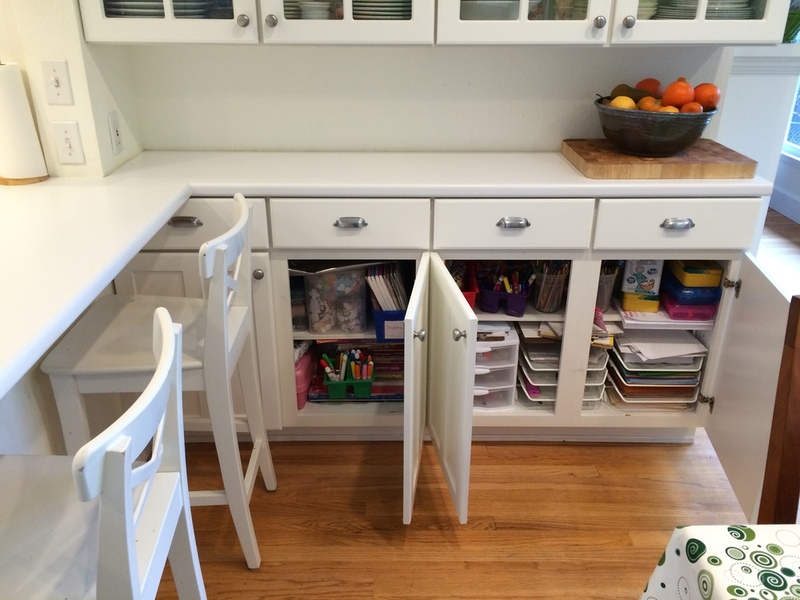 I decided to sacrifice some space recently and convert the lower cabinets to kids space. This houses all our homework and craft supplies. It was tricky to relocate some of the kitchen items I had here, but I'm glad I did because it gives my kids so much more opportunity to be creative when they have easy access to their supplies. It also makes it easy for them to clean up when they are done. My kids are old enough now that I feel comfortable with them having access to their art supplies for independent projects. The only thing I don't keep down here is paint. On the wall in the dining room is our family info center - calendars, school notices, chore charts, behavior charts, schedules, special artwork - it all goes here. I could have cleaned this up for a picture, but this is reality of what it looks like on an average day. In the kitchen I keep all the kids cups and water bottles in a bottom drawer that they can reach. Up until very recently I also had plastic plates and bowls here, but we don't use them any more so they were cleaned out. In the drawers above this I have dish towels, washcloths, and plastic bags & wraps. We have one tall pantry cabinet in the kitchen. I used to use this for food but I don't any more. I actually store very little food in my kitchen. The top section has some small appliances, cereal, vitamins, kids medications. The bottom section has pull out shelves which I have turned into drawers by just adding a plastic bin. The top one has all my plastic storage containers. The second one has lunch boxes and some of my other lunch packing supplies. The bottom two have snack foods that the kids can help themselves to - dried fruit, nuts, granola bars, applesauce, etc. Allowing them to have healthy snacks within reach helps create independence and healthy eating habits. I have two big drawers to the right of the stove. The bottom one has a variety of things - lunch supplies, measuring cups, a few bowls, and the container of cat food (so the kids can easily feed the cats themselves). The middle drawer has some of my most used and prized possessions - my Vitamix and my Cuisinart - I use these almost every day, so I keep them very handy (but not on the counter!!). I also have some glass bowls here that we use basically every day. I have one upper cabinet to the left of the stove that has some cooking supplies - seasonings, oils, vinegars. The containers at the top have baking supplies, rice, hot cereals. And this is where we keep the coffee and tea. As you can see, there really is no food stored in the kitchen other than the kids snack stuff. This works for us because right around the corner is the door to the garage, and the stairs leading to the basement, and those two places are where most of our storage happens. In this picture, the door straight ahead is the garage. Down to the right are the stairs. And to the left goes outside, to the side yard where we keep our trash, recycling, and compost bins. Also here I will point out one of my other most favorite kitchen items: my sweeper vac. This thing is the bomb! For a house full of kids and cats, we absolutely could not live without this. It is mounted right there on the wall and constantly charging. I am not exaggerating when I tell you that I use this thing several times every day. It's the best vacuum I've ever owne. This closet is just at the bottom of the stairs that go down from the kitchen, very convenient even though it's downstairs. We created this space when we remodeled the basement. We actually took the closet out of the bedroom that is right behind this, and instead have a wall of Ikea closets for storage in that. That gave us space for wine and pantry storage. This is where I store the stuff that I use the least often - a variety of baking pans, some serving things, linens, and extras of Costco sized paper and plastic products. We even have a bunch of bottle water and a box of MREs. This is just inside the garage - which is just off the kitchen. With just an inexpensive Ikea cabinet, and some very industrial Home Depot shelving, we created most of our frequently used storage space. This is all my pantry food storage. It might not look like much, but it's more than enough. I don't buy all that much packaged and processed food (for a family of 7), so this doesn't fill up too fast. And just to the right of the pantry are some open shelves where I store my bigger appliances that I use regularly. 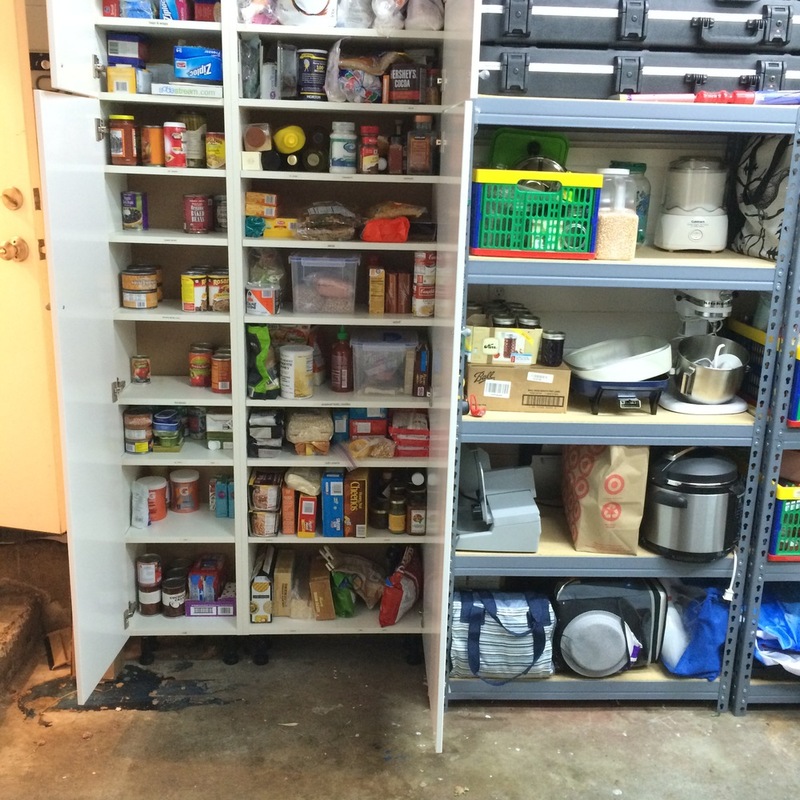 This is where my slow cooker, rice cooker and meat slicer live - items I use weekly. And, as you can see, the ice cream maker, pressure cooker, stand mixer. I have boxes of jam here, and the plastic bin is where all my empty jam jars go as we use them up. All this storage is just steps from my kitchen, so it's really convenient and works well. Also just to the left here in the garage are my second fridge and freezer. Because most of what I cook is from scratch, we always have a fridge and freezer full of fresh ingredients. So there you have it. I hope I've given you a few ideas. I know it's not as perfect and orderly as some of these magazine grade kitchens - but this is a real, working, family kitchen. I prepare 3 meals a day, every day, in this kitchen and it functions very well for me. I sometimes wish I had more storage, but I rarely wish for a bigger kitchen. That would just be more to clean!